Much of the credit for the global village that the world has become goes to the rise of technology, particularly computers. These devices, aided by the internet, have shrunk distances across the world, connecting minds and hearts. Ashwini Beriskar, a 13-year old Akshaya Patra beneficiary studying in Std VIII at Smt Taraben Modak Primary School in Surat, wants to join this information technology industry and become a computer engineer. The daughter of a father who is a rickshaw driver and a mother who is a housewife, Ashwini is a native of Dhule in Maharashtra, living in Surat with her grandparents. Her parents, though afar, inspire her to work hard and put in her best. 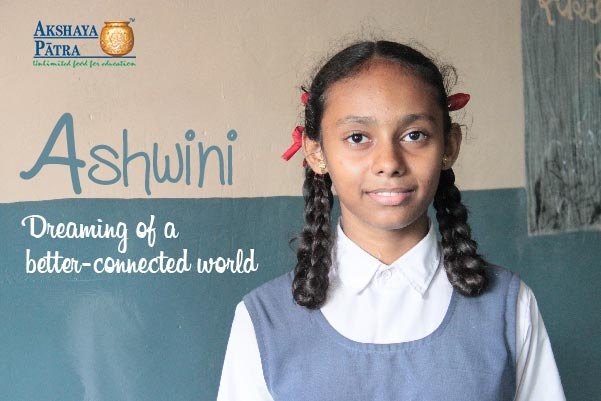 An eloquent young girl, Ashwini likes to participate in essay-writing contests and has written on topics such as ‘Social Work’, ‘Cleanliness’ and more. Her favourite subject is Mathematics, because knowledge of this challenging subject is a requisite for her to achieve her aspirations. She also likes to dance and often takes part in dancing competitions. The determined young girl wants her parents to be proud of her, which is why she wants to study hard and be an independent pillar of strength and support to her father, who is the sole breadwinner for the family.